Losing 10 pounds in two months requires dietary diligence and serious exercise, but it's possible for most people. 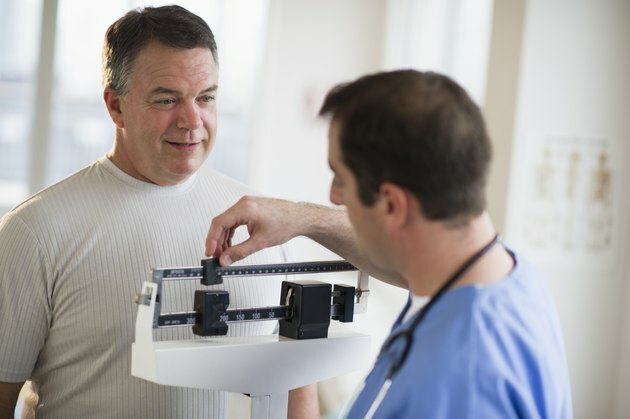 The Centers for Disease Control and Prevention recommends you lose weight no faster than 2 pounds per week, because faster weight loss is more likely to be achieved in an unsound manner. A 10-pound weight loss in two months has you losing just 1.25 pounds per week, which falls into the category of safe and sustainable. To lose weight, you must burn more calories than you consume. A deficit of about 625 calories per day for a week yields a 1.25-pound weight loss, which leads, over two months, to 10 pounds lost. Don't panic if you lose slightly more weight in the first few weeks of your plan -- the rate will level out as your body adjusts. An online calculator or nutritionist can help you estimate your daily calorie needs that include regular activities and exercise. You'll use that daily calorie figure as the number from which you subtract 625 calories to determine your calorie intake goal for losing weight. If cutting 625 calories calls for you to eat fewer than 1,200 calories per day, you'll have to move more to raise your daily burn rate. Consuming fewer than 1,200 calories consistently can slow your metabolism, cause you to lose lean tissue rather than fat, and may prove unsustainable for more than a week or two. For some people, simply eliminating sugary sweets, liquid calories in the form of fancy coffees and soda, and choosing whole-food snacks, such as fruit instead of chips or crackers, will create the deficit necessary to lose 10 pounds in two months. Smaller portion sizes and a focus on healthy, whole foods are other valuable weight-loss strategies. Make most of your meals consist of broiled, grilled, stir-fried or roasted lean protein. Examples include roast chicken breast, hard-boiled eggs, wok-seared tofu or grilled pork tenderloin. A cup of vegetables and 1/2 to 1 cup of whole grains, such as whole-wheat pasta or brown rice, rounds out most meals. Fresh fruit, low-fat plain yogurt or cheese, a few almonds or cut-up vegetables replace higher-calorie snacks. Serving sizes depend on how many calories you can eat each day to prompt weight loss, and a professional can put together a personalized plan for you. Burning more calories through exercise means you don't have to cut as many calories from your diet to reach your goal. Plus, exercise affords numerous health benefits, including reduced risk of chronic disease, better sleep and lower incidence of depression. A minimum of 250 minutes of moderate-intensity cardio weekly -- or about 35 minutes per day -- is necessary to lose significant weight, notes the American College of Sports Medicine. To lose 10 pounds in as soon as two months, you may need to exercise even longer on most days -- especially if you're already active. Strength train in addition to performing cardio activity. Using weights, resistance tubing or your own body weight to build muscle gives you a metabolic advantage, since lean mass burns more calories at rest than fat tissue. The muscle helps your metabolism continue to burn even when you're dieting and losing weight. The heavier you are, the more quickly 10 pounds will come off. But, if it's the last 10 pounds in a lengthy weight-loss program or 10 pounds that means the difference between 140 and 130 pounds, your weight loss may take longer than two months. If you feel you're reducing calories and exercising, but not seeing results, examine your process. You may have to weigh and measure your food to ensure you aren't underestimating portion sizes and inadvertently overeating. Also, review your exercise routine. If you've been doing the same workouts for several months, it might be time to make a change in intensity and mode to break through a plateau. Shape: Ask the Diet Doctor: Is Losing 10 Pounds a Week Safe? Can You Lose 70 Pounds Fast?